SURGE is a free virtual conference assembling association professionals from around the world to have productive conversations around innovation & change. The sessions are the seeds of discussion! As they play, a chat runs simultaneously, where attendees can interact with each other, as well as the speakers. Why is this event called SURGE Co-Creation? Each session of the virtual conference will be produced by a member society or organization that serves the association profession. This is a collaboration like you’ve never seen before. It’s our strong belief that the best way to solve industry problems is through collective knowledge, and SURGE is about coming together as a global community to learn from each other. SURGE is a free interactive virtual conference assembling association professionals from around the world to have productive conversations around innovation & change. The sessions are the seeds of discussion! As they play, a chat runs simultaneously, where attendees can interact with each other, as well as the speakers. Register to begin interacting with fellow association professionals. Immediately start sharing your great ideas, while learning what others are doing. Return the 3 days of the conference to view the sessions, discuss with other attendees, and ask the speakers your burning questions. 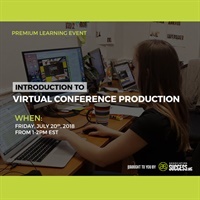 Join AssociationSuccess.org for a live learning event on July 20th from 1-2 PM EST that will teach the basics of producing a virtual conference. As the pre-recorded instructional video plays, there will be a chat running simultaneously, where attendees can weigh in with their comments and questions.